When ~ enters the battlefield, you may create a token that’s a copy of target nontoken artifact. , : Exile @. At the beginning of the next end step, return her to the battlefield tapped under her owner’s control. Metalcraft— Creatures you control have vigilance as long as you control three or more artifacts. This challenge is now closed - please no further changes of entries! EDIT: Considering I'm currently stalling two different games for way too long already, I'll announce a winner in both of them for now. If you want some more feedback, feel free to PM me and I'll respond as soon as possible This challenge really had a lot of pretty nice entries, very fitting for the given locations. In the end, I decided to give the win to viriss, with Akai Ryu as runner-up. She really does win battles! enchantment permanents on the battlefield. 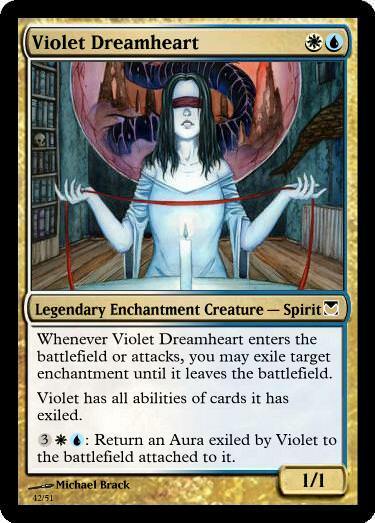 Flavor text not included in render: "She gives freely what all would need, and asks for naught in return but gratitude." Whenever an enchantment you control enters the battlefield, you may have Akko the Star Slinger deal 1 damage to target player or planeswalker. , Sacrifice an enchantment: Akko the Star Slinger deals 1 damage to any target. My submission is rather simple, but I think it works nicely. Constellation— Whenever ~ or another enchantment enters the battlefield under your control, you may put target enchantment card in your graveyard on top of your library. At the beginning of your upkeep, if you control an Aura that isn’t enchanting a permanent you control, you may draw a card. When Kazizel enters the battlefield, pay : Put X Guardian Counters on it (you cannot flicker this ability). 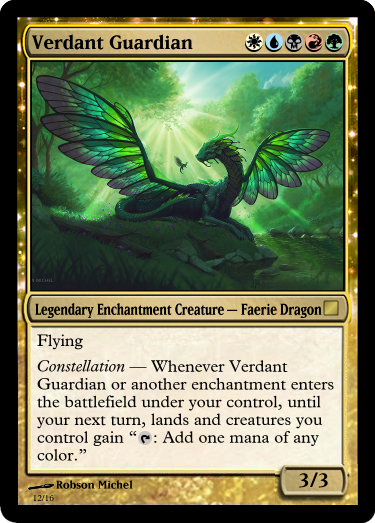 While Kazizel has Guardian Counters on it, enchantments you control gain shroud and indestructible. At the start of your upkeep, remove a Guardian Counter from Kazizel. If Kazizel has no Guardian Counters on it, exile all enchantments you control. If Kazizel is tapped, spells and abilities you cast cost less. Whenever a nontoken enchantment enters the battlefield under your control, create a token that’s a copy of that enchantment. A powerful wizard named Sen made a magical copy of himself shortly before he had a fatal accident and died. His clone, knowing he wasn't real became posessed by surrounding himself with other spells and illusions. Wow. Lots of great entries. I'm glad i picked enchantment. These all prove there is a lot of design space left around them. So Angels are a pretty great example of a long-running race that still has room to innovate - despite existing since the start of Magic, we have 158 printed ones, less than a mere 1% of the card pool. Among those 158, only 31 are Legendaries, and only 2 actually care about other Angels! Your challenge is to design an Angel Commander that brings something new to the table. Whether this means something "A Angel that isn't about the combat step", "An Angel tribal commander that isn't monoW", "A color combination/type combination that hasn't been seen on a legendary angel like mono , Esper ( ), Angel Druid, Angel Wurm, etc...", or something else entirely, that's up to you! 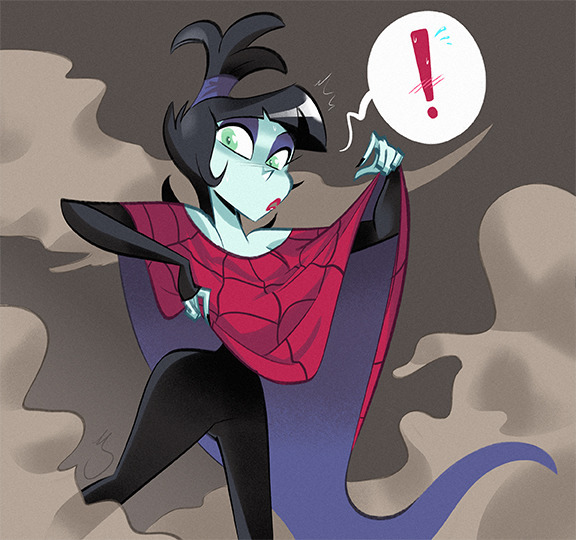 Those prompts are just something to help you get started. Whenever another non-token creature you don't control dies, you and that creature's controller may put a creature card from their hand onto the battlefield. I plan on making some sort of mock up when I get home. Idea is based off of the angel Azrael. T, sacrifice a Human: Return target Angel card from your graveyard to the battlefield. 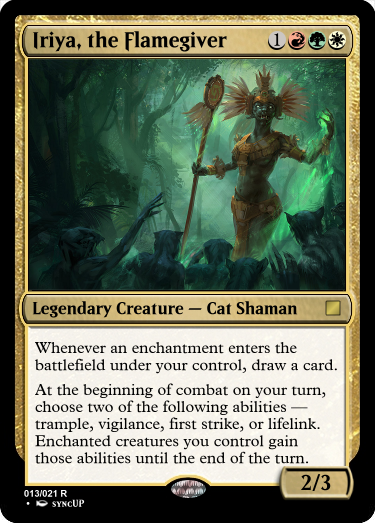 When Cestra, Divine Blessing enters the battlefield, choose a person outside the game. That person may put up to X enchantments with different names he or she owns from outside the game on the battlefield, where X is the number of players. Each enchantment enters the battlefield under a different player’s control chosen at random. I guess that brings a few new enchantments to the table, right? 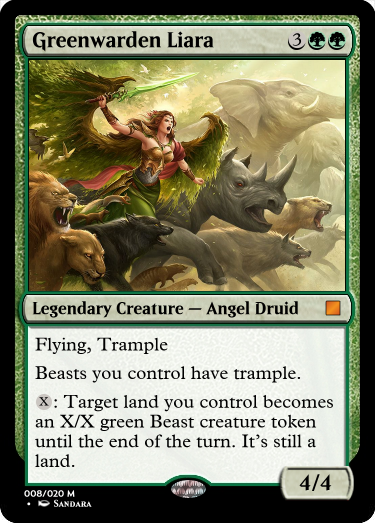 Other creatures can’t block unless their controller pays for each of those creatures. Whenever a creature deals combat damage to a player, that creature’s controller may scry 1. She's , since the promotional frame doesn't show that off. I submit this any time I can. 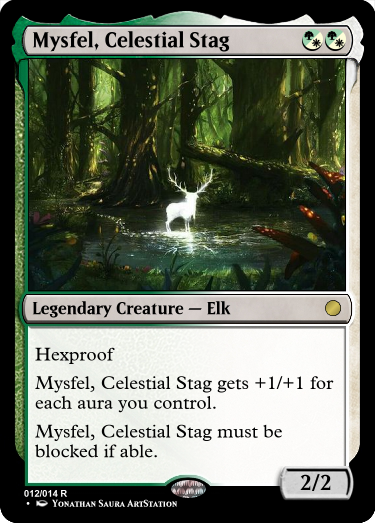 At the beginning of your upkeep, sacrifice another creature. If you do, each opponent loses life equal to that creature's power. "If we make the demons our allies, those we protect will have nothing to fear." 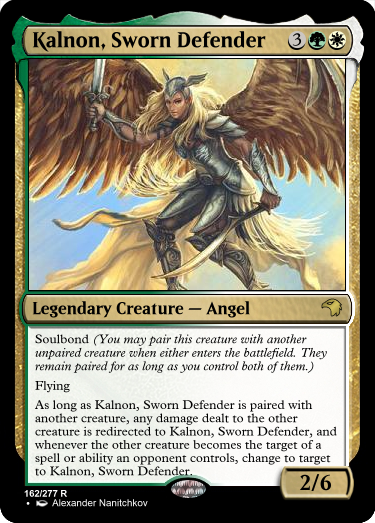 She's the fourth sister of the Powerpuff Girl angels, the one Avacyn killed for consorting with demons. This was also the inspiration for mine. Hence, Lost Flight. Hey I also did the fourth sister without realizing everyone was doing it! 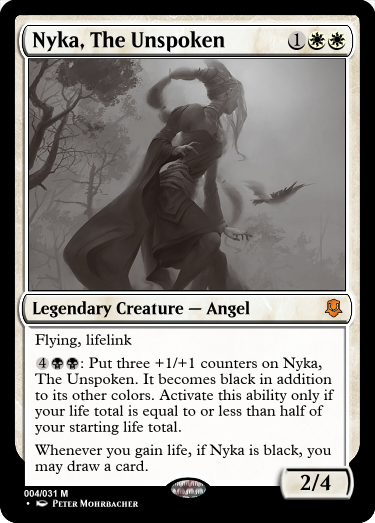 So I too was looking at the fourth unknown angel from the Innistrad plane, but after seeing several others take a shot at that idea (they look cool by the way), decided to go a different direction. I ended up making another one of the Asuras from Bant (they're the highest ranking angels). you or a creature you control. 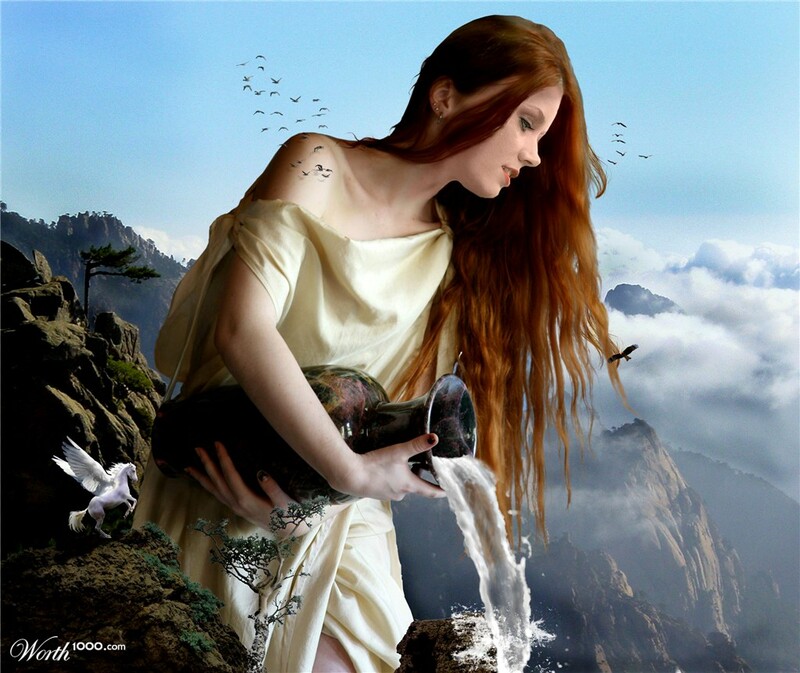 Whenever one or more creatures attack you, those creature's controllers lose X life and you gain X life, where X is the number of Angels you control. The meek shall not lament. Something scaling with Angels you control was I felt a good way to make a scheme creature that's not too backbreaking early. I imagine this would be in a world ruled by a tyrannical field of angels (basically, Serra's Realm gone wildly wrong). 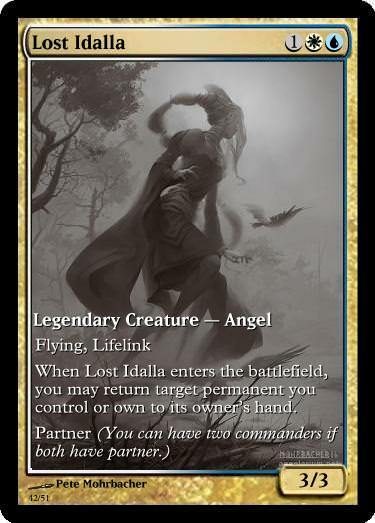 While this is designed for archenemy, it could definitely be interesting as a prison/control commander.